After Gioachino Rossini's death in 1868, Verdi suggested that a number of Italian composers collaborate on a Requiem in Rossini's honor. He began the effort by submitting the concluding movement, the Libera me. During the next year a Messa per Rossini was compiled by Verdi and twelve other famous Italian composers of the time. The premiere was scheduled for 13 November 1869, the first anniversary of Rossini's death. However, on 4 November, nine days before the premiere, the organising committee abandoned it. Verdi blamed this on the scheduled conductor, Angelo Mariani. He pointed to Mariani's lack of enthusiasm for the project, even though he had been part of the organising committee from the start, and it marked the beginning of the end of their friendship. The composition remained unperformed until 1988, when Helmuth Rilling premiered the complete Messa per Rossini in Stuttgart, Germany. In the meantime, Verdi kept toying with his Libera me, frustrated that the combined commemoration of Rossini's life would not be performed in his lifetime. On 22 May 1873, the Italian writer and humanist Alessandro Manzoni, whom Verdi had admired all his adult life and met in 1868, died. Upon hearing of his death, Verdi resolved to complete a Requiem—this time entirely of his own writing—for Manzoni. Verdi traveled to Paris in June, where he commenced work on the Requiem, giving it the form we know today. It included a revised version of the Libera me originally composed for Rossini. The Requiem was first performed in the church of San Marco in Milan on 22 May 1874, the first anniversary of Manzoni's death. Verdi himself conducted, and the four soloists were Teresa Stolz (soprano), Maria Waldmann (mezzo-soprano), Giuseppe Capponi (tenor) and Ormondo Maini (bass). As Aida, Amneris and Ramfis respectively, Stolz, Waldmann, and Maini had all sung in the European premiere of Aida in 1872, and Capponi was also intended to sing the role of Radames at that premiere but was replaced due to illness. Teresa Stolz went on to a brilliant career, Waldmann retired very young in 1875, but the male singers appear to have faded into obscurity. Also, Teresa Stolz was engaged to Angelo Mariani in 1869, but she later left him. The Requiem was repeated at La Scala three days later on 25 May with the same soloists and Verdi again conducting. It won immediate contemporary success, although not everywhere. It received seven performances at the Opéra-Comique in Paris, but the new Royal Albert Hall in London could not be filled for such a Catholic occasion. In Venice, impressive Byzantine ecclesiastical decor was designed for the occasion of the performance. It later disappeared from the standard choral repertoire, but made a reappearance in the 1930s and is now regularly performed and a staple of many choral societies. The playwright and music critic George Bernard Shaw was a great admirer of the work from its first London performance, and had the Libera me played at his funeral. The Requiem was reportedly performed approximately 16 times between 1943 and 1944 by prisoners in the concentration camp of Theresienstadt (also known as Terezín) under the direction of Rafael Schächter. The performances were presented under the auspices of the Freizeitgestaltung, a cultural organization in the Ghetto. Since the 1990s, commemorations in the US and Europe have included memorial performances of the Requiem in honor of the Terezín performances. On the heels of previous performances held at the Terezín Memorial, Murry Sidlin performed the Requiem in Terezin in 2006 and rehearsed the choir in the same basement where the original inmates reportedly rehearsed. Part of the Prague Spring Festival, two children of survivors sang in the choir with their parents sitting in the audience. The Requiem has been staged in a variety of ways several times in recent years. Achim Freyer created a production for the Deutsche Oper Berlin in 2006 that was revived in 2007, 2011 and 2013. In Freyer's staging, the four sung roles, "Der Weiße Engel" (The White Angel), "Der Tod-ist-die-Frau" (Death is the Woman), "Einsam" (Solitude), and "Der Beladene" (The Load Bearer) are complemented by choreographed allegorical characters. In 2011, Oper Köln premiered a full staging by Clemens Bechtel where the four main characters were shown in different life and death situations: the Fukushima nuclear disaster, a Turkish writer in prison, a young woman with bulimia, and an aid worker in Africa. For a Paris performance, Verdi revised the Liber scriptus to allow Maria Waldmann a further solo for future performances. Previously, the movement had been set for a choral fugue in a classical Baroque style. With its premiere at the Royal Albert Hall performance in May 1875, this revision became the definitive edition that has been most performed since and the original fugue now survives only in early published vocal scores. Versions accompanied by four pianos or brass band were also performed. Franz Liszt transcribed the Agnus Dei for solo piano (S. 437). It has been recorded by Leslie Howard. Throughout the work, Verdi uses vigorous rhythms, sublime melodies, and dramatic contrasts—much as he did in his operas—to express the powerful emotions engendered by the text. The terrifying (and instantly recognizable) Dies irae that introduces the traditional sequence of the Latin funeral rite is repeated throughout. Trumpets surround the stage to produce a call to judgement in the Tuba mirum, and the almost oppressive atmosphere of the Rex tremendae creates a sense of unworthiness before the King of Tremendous Majesty. Yet the well-known tenor solo Ingemisco radiates hope for the sinner who asks for the Lord's mercy. The Sanctus (a complicated eight-part fugue scored for double chorus) begins with a brassy fanfare to announce him "who comes in the name of the Lord". Finally the Libera me, the oldest music by Verdi in the Requiem, interrupts. Here the soprano cries out, begging, "Deliver me, Lord, from eternal death ... when you will come to judge the world by fire." When the Requiem was composed, female singers were not permitted to perform in Catholic Church rituals (such as a requiem mass). However, from the beginning Verdi intended to use female singers in the work. In his open letter proposing the Requiem project (when it was still conceived as a multi-author Requiem for Rossini), Verdi wrote: "If I were in the good graces of the Holy Father—Pope Pius IX—I would beg him to permit—if only for this one time—that women take part in the performance of this music; but since I am not, it will fall to someone else better suited to obtain this decree." In the event, when Verdi composed the Requiem alone, two of the four soloists were sopranos, and the chorus included female voices. This may have slowed the work's acceptance in Italy. At the time of its premiere, the Requiem was criticized by some as being too operatic in style for the religious subject matter. According to Gundula Kreuzer, "Most critics did perceive a schism between the religious text (with all its musical implications) and Verdi's setting." Some viewed it negatively as "an opera in ecclesiastical robes," or alternatively, as a religious work, but one in "dubious musical costume." While the majority of critics agreed that the music was "dramatic," some felt that such treatment of the text was appropriate, or at least permissible. As to the music qua music, the critical consensus agreed that the work displayed "fluent invention, beautiful sound effects and charming vocal writing." Critics were divided between praise and condemnation with respect to Verdi's willingness to break standard compositional rules for musical effect, such as his use of consecutive fifths. strings: violins I, II, violas, violoncellos, double basses. ^ a b CD liner notes (Verdi: Requiem / Quattro pezzi sacri). Naxos Records. 1997. 8.550944-45. ^ "REQUIEM | Okanagan Symphony Orchestra". Retrieved 2019-01-12. ^ "Defiant Requiem: Verdi at Terezin" on pbs.org. Retrieved 29 December 2013: See Theresienstadt concentration camp for "Terezin"
Verdi, Giuseppe; (Ed., Marco Uvietta, 2014) Messa da requiem. Critical edition. Kassel: Bärenreiter Verlag. 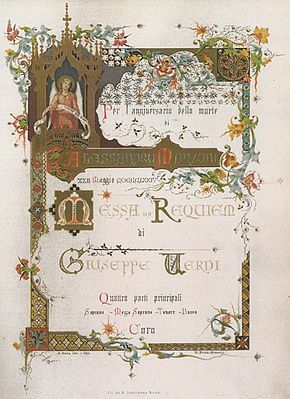 Digitised copy of Verdi's Messa Da Requiem published by Ricordi in Milan 1874, from National Library of Scotland. This page was last edited on 23 March 2019, at 20:28 (UTC).